Teen Summer Job Outlook: Teen Employment Gains Decline in 2017, To Remain Stagnant in 2018 | Challenger, Gray & Christmas, Inc.
With Mother’s Day approaching, some moms may think the best gift would be for their teenager to get a job. 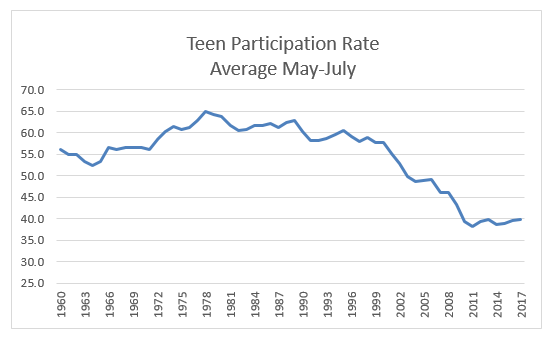 However, fewer teens are opting to secure summer employment. In its annual outlook, global outplacement and executive coaching firm Challenger, Gray & Christmas, Inc. predicts teen hiring will remain stagnant this summer, as more and more teens focus on education, family obligations, and extracurricular activities. Although over 1 million teens found jobs in June of last year, the strongest hiring numbers for this cohort since 2007, teen hiring fell nearly 4 percent last summer to 1,288,000 jobs gained, according to an analysis of data from the Bureau of Labor Statistics by Challenger. Employment among workers aged 16 to 19 was 190,000 in July, the lowest July total on record. That is 61.4 percent lower than the 492,000 job gains in July 2016. Last year’s summer total was the lowest number of job gains since 2015, when 1,160,000 teens found positions. “Some of these declines could be due to the pivot in retail, which is leading to thousands of store closures. In March, Toys“R”Us, a large employer of teens, announced they were closing all of their U.S. stores. Since January 2017, Challenger has tracked over 5,000 announced closures of retail locations,” said Andrew Challenger, Vice President of Challenger, Gray & Christmas, Inc.
“However, teen employment has been falling steadily since the 90s and especially since the recession. 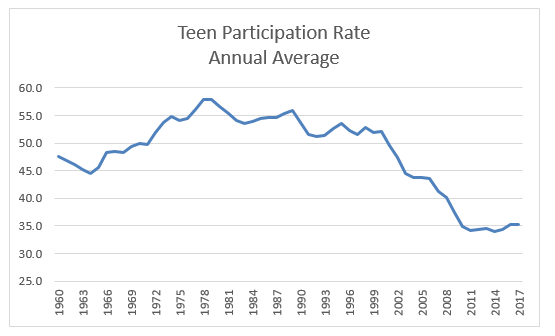 The teen participation rate in the summer months has hovered near 40 percent since 2009, well below the highs of the 70s, 80s, and 90s at near or over 60 percent,” he added. “With the myriad responsibilities facing American teens, it’s no wonder few opt to add “summer job” to the list. However, the kinds of jobs that employ most teenagers help build crucial soft skills that many employers value,” said Challenger. In fact, according to the Pew Research Center, wages have risen faster in occupations that require more social and analytical skills compared to occupations that require manual labor. From 1990 to 2015, the average hourly wage for occupations requiring higher levels of analytical skills rose from $23 to $27, while the mean hourly wage for occupations requiring higher levels of social skills rose from $22 to $26. That is compared to an increase from $16 to $18 for jobs requiring average or above average physical skills in the same time period. “Jobs that are customer-facing, those that require teens to interact with colleagues in an office setting or even lead children in summer activities, help develop skills that employers routinely seek in new hires. It would be wise for teens to consider trying to fit a part-time summer position into their busy schedules,” said Challenger.